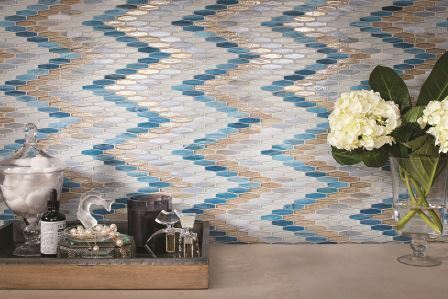 For its latest collection of glass mosaic tiles, Lunada Bay Tile has channeled vintage textile patterns and weaving techniques from around the world. The new Textile line is created through a meticulous translation of embroidery, woven fabrics, and other textures into imaginative, sustainable, glimmering surfaces ideal for commercial and residential applications. Bargello: The name “Bargello” originates from the Bargello palace in Florence, Italy, specifically tracing back to a pair of 17th century chairs boasting a unique upholstery, made even more interesting by fusing in a flame stitch pattern. To emulate the needlepoint embroidery, in which vibrant wool threads were stitched onto canvas with upright flat stitches, martini-glass-shaped tiles are installed in a geometric wave with alternating colors. Imberline: Lunada Bay Tile created Imberline in honor of traditional weaving techniques that combine various colored stripes. 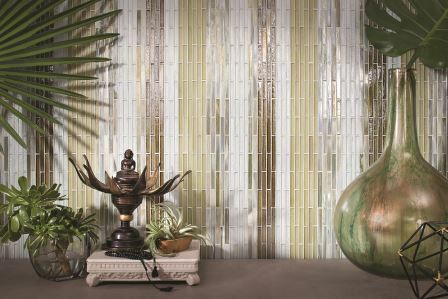 The lustrous glass tiles, measuring ½” x 4″, are ideal for walls and backsplashes, where a dramatic stripe can make a visual impact. Normandie Deco: For this pattern, Lunada Bay Tile gives a wave to the opulent Deco furnishings found on the SS Normandie, a 1930s French luxury ocean liner. The ½” x ½” mosaics lay out in a repeating arrow pattern of light-colored tiles interspersed on a field of brightly colored blends. Each glass mosaic tile pattern is available in six colorways: Anise, Blue Stone, Flannel, Lunar Eclipse, Mica, and Morning Light.